Falcon Beach Ranch, Falcon Lake, Manitoba. Information, Photos and Reviews. Authentic log cabins nestled in the forest await you at our family-owned and operated ranch in the beautiful Whiteshell Provincial Park of southeastern Manitoba, only 1.5 hours east of Winnipeg on the Trans Canada Highway. 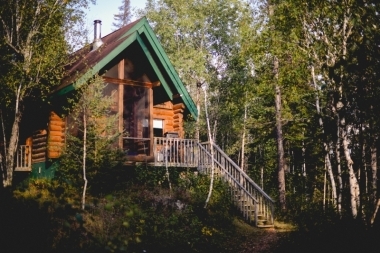 Guests stay in rustic luxury in one of three log cabins nestled in the boreal forest. Private enough for a romantic retreat, yet close enough for a multi-family holiday, each cabin has a fireplace and cathedral ceiling, and is equipped with a full kitchen, main floor bedroom and sleeping loft, screened porch and BBQ. Linens (towels and bedding) are provided. 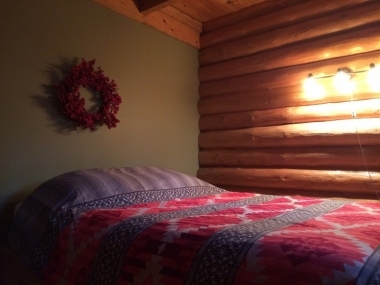 A year-round outdoor hot tub and cedar log sauna are situated central to the cabins, and guests have access to an outdoor firepit (year-round), snowshoes and skating rink (winter season). Falcon Beach Ranch is open year-round, so whether you prefer to travel in the summer or winter, or sometime in between, there are places to explore and adventures to be had. 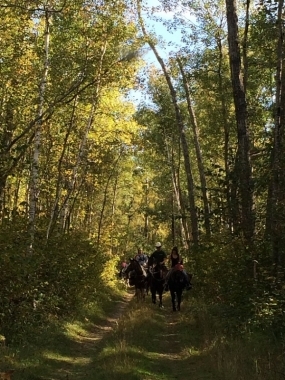 Horseback riding is available all year long and is offered at a discount to our cabin guests. Summer activities at the ranch include cookouts, wagon rides, and children's day camps, and nearby are beaches, hiking & biking trails, fishing & boat rentals, golfing, mini-golf, and summer festivals (Falcon Lake Fun Fest and West Hawk Lake Meteor Fest), Winter ranch activities include sleigh rides through the winter wonderland of the boreal forest, snowshoeing, ice skating & pond hockey, and nearby are downhill and cross-country skiing, ice fishing (including the Falcon Lake Winter Fish-Off ice fishing derby), snowmobile trails, and winter festivals (Snowdance and Beaver Days). Nobody has reviewed Falcon Beach Ranch yet, Be the first. You are submitting a booking enquiry. Falcon Beach Ranch will then contact you by email with details of availability and prices.